5 June 2015, Athens – Christodoulos Xiros, ex-member of the Revolutionary Organisation 17 November, who is facing charges for participation in the Conspiracy of Cells of Fire escape attempt that was foiled in January by the Greek authorities, denied to answer any questions from the judicial apparatus and made a political statement. In his brief political statement, Xiros expressed his views and called on the examining magistrate Eftihis Nikopoulos and everyone that he works for to apologize themselves. Since yesterday morning, March 21st, hunger striker Dimitris Koufontinas (convicted 17N member) has been transferred from the type C maximum security prison of Domokos to the provincial hospital in Lamia, where he’s being held in a room-cell with no window. In addition to the miserable conditions, it becomes difficult, if not impossible, for supporters to communicate with any prisoner who may find themselves moved to this hospital. UPDATE: The anarchists abandoned the building 1 am, 9 March, without having received any official answer from the governing party. 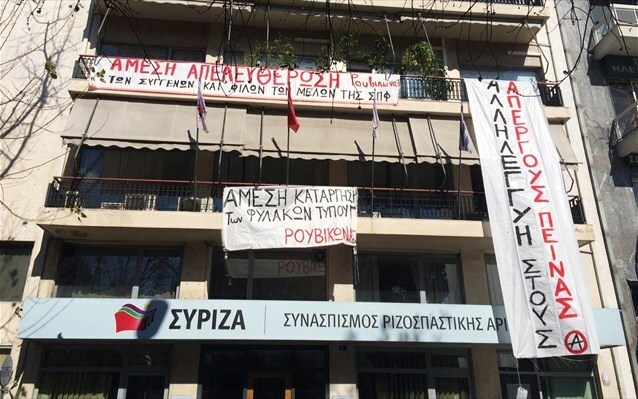 Today Sunday 8 of March we occupy the central offices of the government SYRIZA in Koumoundourou street. We stand in solidarity with the hunger strikers, political prisoners in Greece and we ask that their demands are satisfied. 1. Abolition of the Anti terrorist Law Α’, article 187, Law 2001 (criminal organization). 2. Abolition of the Anti terrorist Law B’, article 187A, Law 2004 (terrorist organizations). 3. Abolition of the “hoodie law” (acts committed with concealed physical characteristics). 4. Abolition of the legal framework for Type C prisons. 5. The immediate release from prison of Savvas Xiros (convicted for his participation in the R.O. 17 November) on health grounds. 6. Against the criminalization of the family relations of the members of the R.O. Conspiracy of Cells of Fire. In the text below, Nikos Maziotis, member of Revolutionary Struggle, suggests the creation of an assembly of solidarity for all political detainees and prisoners-fighters. Text below from Nikos Maziotis, member of Revolutionary Struggle, to the open assembly of Anarchists / Anti-authoritarians against the specific Type C conditions of detention, Maziotis proposes the creation of a solidarity meeting for all political detainees and prisoners-fighters. At the same time it is an open call to all comrades and companions of the anarchist / anti-authoritarian domain to participate and support this endeavour. In the short term the date and location where the first meeting to explore possibilities to set up the Solidarity Assembly will be announced. The text is sent to all political detainees and imprisoned fighters. Comrades – companions, this text addresses you concerning Type C prisons, and my proposal for the creation of a meeting as concerns the issue of solidarity. Comrades – companions, the passing of legislation of the Type C prisons are an expected development in the repressive attack of the State against the armed Revolutionary Organizations and against armed direct action. Subsequently, the legislative changes and reforms that have been under way for about 14 years are directly linked to the political and economic conditions, applicable for years internationally, and none other than the “war on terror” and the neoliberal reforms intended to impose the dictatorship of the markets, and its doctorate of supranational capital. As Revolutionary Struggle, since the beginning of our activities in 2003, I believe that we properly analyzed the political and economic conditions in the early nineties when we started our activities, conditions relating to the globalization of the capitalist system. Both the “war on terror” launched in 2001 following the attacks on the United States, and the neoliberal reforms that conduced and were designed by the dictatorship of transnational capital is not only the economic and civilian-relevant nature of globalization. The system, therefore, in order to impose the dictatorship of markets proceeds at an increasingly harder crackdown as it tends to become more and more totalitarian.